Credit repair is about “document processing.” The letters are “from” your clients and in most cases you’re signing their names, so your clients should be dictating what to dispute and why. That’s good, honest “transparent” business. 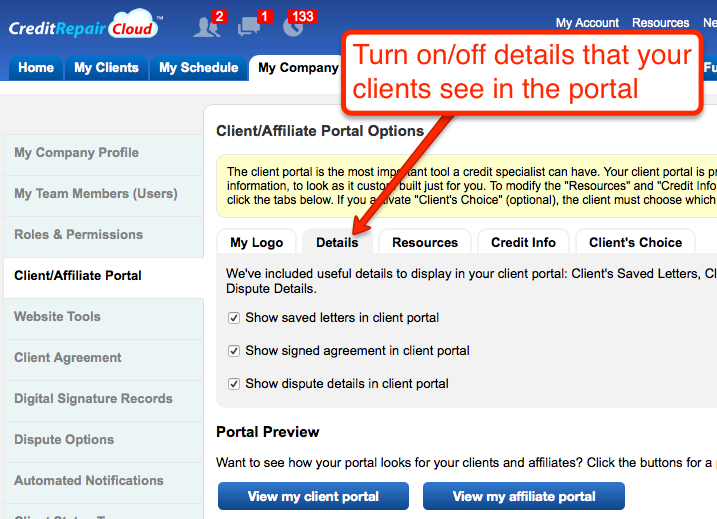 However, occasionally we will have a software user who wants to prevent their clients from seeing these details in the client portal and they want to hide the “reasons” for the disputes. Or they call them “trade secrets.” We do not recommend operating your business in this secret way or hiding things from your clients as it can get you into big trouble. The letters are “from” your clients, so if you’re choosing reasons for dispute that your client is not aware of, you can get in very big trouble with the FTC, and that can be very painful and expensive. So before continuing down that road, you might want to consult with an attorney. That being said, we have customers who run transparent businesses and we have customers who hide things from their clients, so we have both options in the settings. If you want to be transparent you can, and if you want to hide things from clients you can. It’s your choice. (On a personal note; I’ve noticed that the businesses who are transparent with their clients and do the right thing tend to be far more successful than the businesses who operate in secrecy).